This paper presents an overview of recent advances in multiaxis control and multitasking machining, the machine tools’ kinematic configurations, and the supporting and cutting technologies used for complex form shaping. The functions of the metal cutting machine tools have been expanded to meet high productivity and high accuracy requirements for machining complicated and difficult parts on a single machine. Among these functions, the increase in the number of controlled axes and the multitasking capability in one chucking process enable machine tools to manufacture complex products efficiently. The historical background and application field of machine tools are discussed, mainly by taking examples from turning- and milling-based machining. Then, research challenges to improve machining results are introduced. This paper also presents examples of the latest cutting technologies and the current status of related supporting technologies. T. Moriwaki, “Multi-functional machine tool,” CIRP Annals – Manufacturing Technology, Vol.57, pp. 736-749, 2008. H-C. Möhring, C. Brecher., E. Abele, J. Fleischer, and F. Bleicher, “Materials in machine tool structures,” CIRP Annals – Manufacturing Technology, Vol.64, pp. 725-748, 2015. Y. Altintas, P. Kersting, D. Biermann, E. Budak, B. Denkena, and I. Lazoglu, “Virtual process systems for part machining operations,” CIRP Annals – Manufacturing Technology, Vol.63, pp. 585–605, 2014. M. Nakaminami, T. Tokuma, T. Moriwaki, and K. Nakamoto, “Optimal structure design methodology for compound multiaxis machine tools I – Analysis of requirements and specifications –,” Int. J. of Automation Technology, Vol.1, No.2, pp. 78-86, 2007. M. Sudo, “Advanced control technologies for 5-axis machining,” Int. J. of Automation Technology, Vol.1, No.2, pp. 108-112, 2007. M. Mori, H. Ota, and M. Fujishima, “Development of high-speed high-precision 5-axis integrated machine tools,” Int. J. of Automation Technology, Vol.1, No.2, pp. 103-107, 2015. N. Takayama, H. Ota, K. Ueda, and Y. Takeuchi, “Development of table-on-table-type five-axis machining center: new structure and basic characteristics,” Int. J. of Automation Technology, Vol.5, No.2, pp. 247-254, 2011. K. Hiramoto, A. Hansel, S. Ding, and K. Yamazaki, “A study on the drive at center of gravity (DCG) feed principle and its application for development of high performance machine tool systems,” CIRP Annals – Manufacturing Technology, Vol.54, pp. 333-336, 2005. L. Uriartea, M. Zatarain, D. Axinte, J. Yagüe-Fabra, S. Ihlenfeldt, J. Eguia, and A. Olarra, “Machine tools for large parts,” CIRP Annals – Manufacturing Technology, Vol.62, pp. 731-750, 2013. S. Ibaraki, T. Okuda, Y. Kakino, M. Nakagawa, T. Matsushita, and T. Ando, “Compensation of gravity-induced errors on a hexapod-type parallel kinematic machine tool,” JSME Int. J., Series C, Vol.47, No.1, pp. 160-167, 2004. D.S. Milutinovic, M. Glavonjic, V. Kvrgic, and S. Zivanovic, “A new 3-DOF spatial parallel mechanism for milling machines with long X travel,” CIRP Annals – Manufacturing Technology, Vol.54, pp. 345-348, 2005. A. Verl, T. Boye, and A. Pott, “Measurement pose selection and calibration forecast for manipulators with complex kinematic structures,” CIRP Annals – Manufacturing Technology, Vol.57, pp. 425-428, 2008. Y. Shneor, and V.T. Portman, “Stiffness of 5-axis machines with serial, parallel, and hybrid kinematics: Evaluation and comparison,” CIRP Annals – Manufacturing Technology, Vol.59, pp. 409-412, 2010. M. Mitsuishi, S. Warisawa, N. Sugita, M. Suzuki, H. Moriya, H. Hashizume, K. Fujiwara, N. Abe, H. Inoue, K. Kuramoto, T. Inoue, Y. Nakashima, and K. Tanimoto, “A study of bone micro-cutting characteristics using a aewly developed advanced bone cutting machine tool for total knee arthroplasty,” CIRP Annals – Manufacturing Technology, Vol.54, pp. 41-46, 2005. A. Yuen, and Y. Altintas, “Trajectory generation and control of a 9 axis CNC micromachining center,” CIRP Annals – Manufacturing Technology, Vol.65, pp. 349-352, 2016. M. Hedlind, and T. Kjellberg, “Kinematical product specifications in engineering design,” CIRP Annals – Manufacturing Technology, Vol.63, pp. 197-200, 2014. Z. Yu, K. Nakamoto, T. Ishida, and Y. Takeuchi, “Interactive design-assistance system of machine tool structure in conceptual and fundamental design stage,” Int. J. of Automation Technology, Vol.4, No.3, pp. 303-311, 2010. Z. Yu, K. Nakamoto, T. Ishida, and Y. Takeuchi, “Study on an interactive system for conceptual and basic design of machine tool structure,” J. of Advanced Mechanical Design, Systems, and Manufacturing, Vol.4, No.5, pp. 795-805, 2010. Z. Yu, K. Nakamoto, and Y. Takeuchi, “Development of an interactive assistance system for machine tool structure design considering of sliding joint damping,” Int. J. of Automation Technology, Vol.5, No.5, pp. 722-728, 2011. M. Nakaminami, T. Tokuma, K. Matsumoto, S. Sakashita, T. Moriwaki, and K. Nakamoto, “Optimal structure design methodology for compound multiaxis machine tools II – Investigation of basic structure –,” Int. J. of Automation Technology, Vol.1, No.2, pp. 87-93, 2007. M. Nakaminami, T. Tokuma, K. Matsumoto, S. Sakashita, T. Moriwaki, and K. Nakamoto, “Optimal structure design methodology for compound multiaxis machine tools III – Performance evaluation –,” Int. J. of Automation Technology, Vol.2, No.1, pp. 70-77, 2008. H. Schwenke, W. Knapp, H. Haitjema, A. Weckenmann, R. Schmitt, and F. Delbressine, “Geometric error measurement and compensation of machines – An update,” CIRP Annals – Manufacturing Technology, Vol.57, pp. 660-675, 2008. S. Ibaraki, and W. Knapp, “Indirect measurement of volumetric accuracy for three-axis and five-axis machine tools: A review,” Int. J. of Automation Technology, Vol.6, No.2, pp. 110-124, 2012. W. Knapp, and S. Weikert, “Testing the contouring performance in 6 degrees of freedom,” CIRP Annals – Manufacturing Technology, Vol.48, pp. 433-436, 1999. T. Saiki, M. Tsutsumi, H. Suzuki, M. Kouya, and M. Ushio, “Development of measurement for motion accuracy of 5 axis NC machine tool,” Int. J. of Automation Technology, Vol.2, No.2, pp. 111-118, 2008. Y. Morimoto, K. Nakato, and M. Gontani, “Accuracy evaluation of 5-axis machining center based on measurements of machined workpiece,” Int. J. of Automation Technology, Vol.6, No.5, pp. 675-681, 2012. J.R.R. Mayer, “Five-axis machine tool calibration by probing a scale enriched reconfigurable uncalibrated master balls artefact,” CIRP Annals – Manufacturing Technology, Vol.61, pp. 515-518, 2012. J.R.R. Mayer, M.M. Rahman, and A. Los, “An uncalibrated cylindrical indigenous artefact for measuring inter-axis errors of a five-axis machine tool,” CIRP Annals – Manufacturing Technology, Vol.64, pp. 487-490, 2015. I. Inasaki, K. Kishinami, S. Sakamoto, Y. Takeuchi, and F. Tanaka, “Shape generation theory of machine tools – its basis and application,” Yokendo, Tokyo, 1997 (in Japanese). M. Tsutsumi, and A. Saito, “Identification and compensation of systematic deviations particular to 5-axis machining centers,” Int. J. of Machine Tools and Manufacture, Vol.43, pp. 771-780, 2003. A. Archenti, and M. Nicolescu, “Accuracy analysis of machine tools using Elastically Linked Systems,” CIRP Annals – Manufacturing Technology, Vol.62, pp. 503-506, 2013. M. Tsutsumi, and A. Saito, “Identification of angular and positional deviations inherent to 5-axis machining centers with a tilting-rotary table by simultaneous four-axis control movements,” Int. J. of Machine Tools and Manufacture, Vol.44, pp. 1333-1342, 2004. Y. Ihara, and S. Matsushita, “A study on tool position and posture measurement device by using parallel mechanism,” Int. J. of Automation Technology, Vol.3, No.3, pp. 271-276, 2009. Y. Ihara, and Y. Hiramatsu, “Design of motion accuracy measurement device for NC machine tools with three displacement sensors,” Int. J. of Automation Technology, Vol.5, No.6, pp. 847-854, 2011. S. Weikert, “R-test, a new device for accuracy measurements on five axis machine tools,” CIRP Annals – Manufacturing Technology, Vol.53, pp. 429-432, 2004. B. Bringmann, and W. Knapp, “Model-based ‘chase-the-ball’ calibration of a 5-axes machining center,” CIRP Annals – Manufacturing Technology, Vol.55, pp. 531-534, 2006. S. Ibaraki, T. Iritani, and T. Matsushita, “Calibration of location errors of rotary axes on five-axis machine tools by on-the-machine measurement using a touch-trigger probe,” Int. J. of Machine Tools and Manufacture, Vol.58, pp. 44-53, 2012. S. Ibaraki, T. Iritani, and T. Matsushita, “Error map construction for rotary axes on five-axis machine tools by on-the-machine measurement using a touch-trigger probe,” Int. J. of Machine Tools and Manufacture, Vol.68, pp. 21-29, 2013. S. Ibaraki, and Y. Ota, “Error calibration for five-axis machine tools by on-the-machine measurement using a touch-trigger probe,” Int. J. of Automation Technology, Vol.8, No.1, pp. 20-27, 2014. U. Heisel, G. Koscsák, and T. Stehle, “Thermography-based investigation into thermally induced positioning errors of deed drives by example of a ball screw,” CIRP Annals – Manufacturing Technology, Vol.55, pp. 423-426, 2006. J. Mayr, J. Jedrzejewski, E. Uhlmann, M.A. Donmez, W. Knapp, F. Härtig, K. Wendt, T. Moriwaki, P. Shore, R. Schmitt, C. Brecher, T. Würz, and K. Wegener, “Thermal issues in machine tools,” CIRP Annals – Manufacturing Technology, Vol.61, pp. 771-791, 2012. 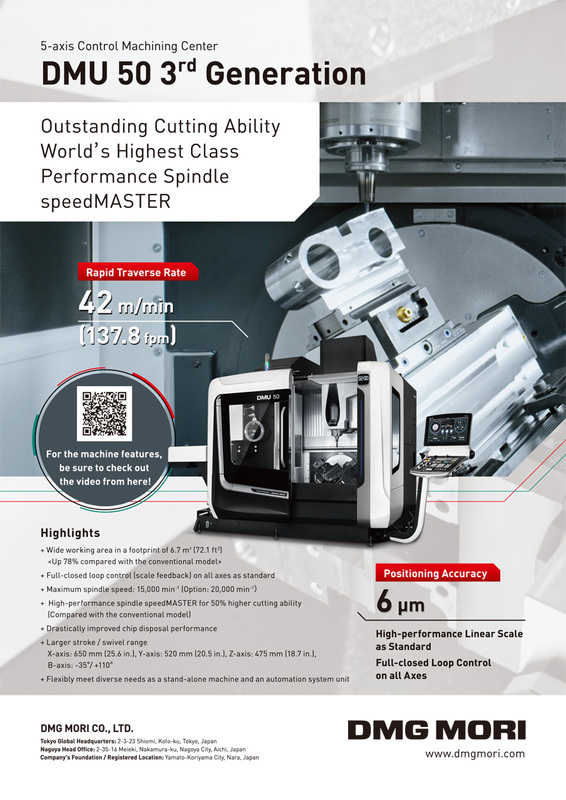 M. Mitsuishi, S. Warisawa, and R. Hanayama, “Development of an intelligent high-speed machining center,” CIRP Annals – Manufacturing Technology, Vol.50, pp. 275-280, 2001. C. Hong, and S. Ibaraki, “Observation of thermal influence on error motions of rotary axes on a five-axis machine tool by static R-test,” Int. J. of Automation Technology, Vol.6, No.2, pp. 196-204, 2012. M. Gebhardt, J. Mayr, N. Furrer, T. Widmer, S. Weikert, and W. Knapp, “High precision grey-box model for compensation of thermal errors on five-axis machines,” CIRP Annals – Manufacturing Technology, Vol.63, pp. 506-512, 2014. J. Mayr, M. Müller, and S. Weikert, “Automated thermal main spindle & B-axis error compensation of 5-axis machine tools,” CIRP Annals – Manufacturing Technology, Vol.65, pp. 479-482, 2016. S. Shimizu, G. Ooi, and S. Yagyu, “New measuring method for thermal deviations caused by linear axis motion in multi-task machine,” JSME Int. J., Series C, Vol.49, No.2, pp. 316-321, 2006. R. Sato, and M. Tsutsumi, “High performance motion control of rotary table for 5-axis machining centers,” Int. J. of Automation Technology, Vol.1, No.2, pp. 113-119, 2007. Y. Altintas, K. Erkorkmaz, and W.H. Zhu, “Sliding mode controller design for high speed feed drives,” CIRP Annals – Manufacturing Technology, Vol.49, pp. 265-270, 2000. P. Boucher, D. Dumur, and P. Rodriguez, “Robustification of CNC controllers for machlne tools motor drives,” CIRP Annals – Manufacturing Technology, Vol.52, pp. 293-296, 2003. W. Symens, H.V. Brussel, and J. Swevers, “Gain-scheduling control of machine tools with varying structural flexibility,” CIRP Annals – Manufacturing Technology, Vol.53, pp. 321-324, 2004. M. Zatarain, I.R. Argandona, A. Illarramendi, J.L. Azpeitia, and R. Bueno, “New control techniques based on state space observers for improving the precision and dynamic behaviour of machine tools,” CIRP Annals – Manufacturing Technology, Vol.54, pp. 393-396, 2005. Y. Altintas, and B. Sencer, “High speed contouring control strategy for five-axis machine tools,” CIRP Annals – Manufacturing Technology, Vol.59, pp. 417-420, 2010. D. Dumur, P. Boucher, and J. Röder, “Advantages of an open architecture structure for the design of predictive controllers for motor drives,” CIRP Annals – Manufacturing Technology, Vol.47, pp. 291-294, 1998. Y. Altintas, and N.A. Erol, “Open architecture modular tool kit for motion and machining process control,” CIRP Annals – Manufacturing Technology, Vol.47, pp. 295-300, 1998. M. Mori, K. Yamazaki, M. Fujishima, J. Liu, and N. Furukawa, “A study on development of an open servo system for intelligent control of a CNC machine tool,” CIRP Annals – Manufacturing Technology, Vol.50, pp. 247-250, 2001. G. Pritschow, and C. Kramer, “Open system architecture for drives,” CIRP Annals – Manufacturing Technology, Vol.54, pp. 375-378, 2005. M. Susanu, and D. Dumur, “Hierarchical predictive control within an open architecture virtual machine tool,” CIRP Annals – Manufacturing Technology, Vol.55, pp. 389-392, 2006. Y. Altintas, C. Brecher, M. Weck, and S. Witt, “Virtual machine tool,” CIRP Annals – Manufacturing Technology, Vol.54, pp. 651-704, 2005. K. Erkorkmaz, Y. Altintas, and C.H. Yeung, “Virtual computer numerical control system,” CIRP Annals – Manufacturing Technology, Vol.55, pp. 399-402, 2006. K. Erkorkmaz, and W. Wong, “Rapid identification technique for virtual CNC drives,” Int. J. of Machine Tools and Manufacture, Vol.47, pp. 1381-1392, 2007. B. Sencer, and Y. Altintas, and M. Tsutsumi, “Identification of 5-axis machine tools feed drive systems for contouring smulation,” Int. J. of Automation Technology, Vol.5, No.3, pp. 377-386, 2011. Y. Altintas, and M. Weck, “Chatter stability of metal cutting and grinding,” CIRP Annals – Manufacturing Technology, Vol.53, pp. 619-642, 2004. Y. Altintas, and E. Budak, “Analytical prediction of stability lobes in milling,” CIRP Annals – Manufacturing Technology, Vol.44, pp. 357-362, 1995. E. Abele, and U. Fiedler, “Creating stability lobe diagrams during milling,” CIRP Annals – Manufacturing Technology, Vol.53, pp. 309-312, 2004. E. Budak, and A. Tekeli, “Maximizing chatter free material removal rate in milling through optimal selection of axial and radial depth of cut pairs,” CIRP Annals – Manufacturing Technology, Vol.54, pp. 353-356, 2005. E. Govekarl, J. Gradišek, M. Kalveram, T. Insperger, K. Weinert, G. Stépán, and I. Grabec, “On stability and dynamics of milling at small radial immersion,” CIRP Annals – Manufacturing Technology, Vol.54, pp. 357-362, 2005. Y. Altintas, and J.H. Ko, “Chatter stability of plunge milling,” CIRP Annals – Manufacturing Technology, Vol.55, pp. 361-364, 2006. J. Munoa, X. Beudaert, K. Erkorkmaz, A. Iglesias, A. Barrios, and M. Zatarain, “Active suppression of structural chatter vibrations using machine drives and accelerometers,” CIRP Annals – Manufacturing Technology, Vol.64, pp. 385-388, 2015. E. Shamoto, and K. Akazawa, “Analytical prediction of chatter stability in ball end milling with tool inclination,” CIRP Annals – Manufacturing Technology, Vol.58, pp. 351-354, 2009. D. Biermann, P. Kersting, and T. Surmann, “A general approach to simulating workpiece vibrations during five-axis milling of turbine blades,” CIRP Annals – Manufacturing Technology, Vol.59, pp. 125-128, 2010. E. Budak, L.T. Tunç, S. Alan, and H.N. Özgüven, “Prediction of workpiece dynamics and its effects on chatter stability in milling,” CIRP Annals – Manufacturing Technology, Vol.61, pp. 339-342, 2012. E. Shamoto, T. Mori, K. Nishimura, T. Hiramatsu, and Y. Kurata, “Suppression of regenerative chatter vibration in simultaneous double-sided milling of flexible plates by speed difference,” CIRP Annals – Manufacturing Technology, Vol.59, pp. 387-390, 2010. E. Budak, and E. Ozturk, “Dynamics and stability of parallel turning operations,” CIRP Annals – Manufacturing Technology, Vol.60, pp. 383-386, 2011. C. Brecher, Y. Trofimov, and S. Bäumler, “Holistic modelling of process machine interactions in parallel milling,” CIRP Annals – Manufacturing Technology, Vol.60, pp. 387-390, 2011. E. Budak, A. Comak, and E. Ozturk, “Stability and high performance machining conditions in simultaneous milling,” CIRP Annals – Manufacturing Technology, Vol.62, pp. 403-406, 2013. S. Hinduja, and D. Sandiford, “An optimum two-tool solution for milling 21/2D features from technological and geometric viewpoints,” CIRP Annals – Manufacturing Technology, Vol.53, pp. 77-80, 2004. M.C. Leu, and W. Zhang, “Virtual sculpting with surface smoothing based on level set method,” CIRP Annals – Manufacturing Technology, Vol.57, pp. 167-170, 2008. H. Kameyama, I. Otomo, M. Onosato, and F. Tanaka, “Using a four-dimensional mesh model to represent a tool motion trajectory in five-axis machining,” Int. J. of Automation Technology, Vol.8, No.3, pp. 437-444, 2014. B. Koninckx, and H.V. Brussel, “Real-time NURBS interpolator for distributed motion control,” CIRP Annals – Manufacturing Technology, Vol.51, pp. 315-318, 2002. L.Y. Zhang, R.R. Zhou, J.Y. Zhu, and X. Wu, “Piecewise B-spline surfaces fitting to arbitrary triangle meshes,” CIRP Annals – Manufacturing Technology, Vol.51, pp. 131-134, 2002. B. Lauwers, G. Kiswanto, and J.P. Kruth, “Development of a five-axis milling tool path generation algorithm based on faceted models,” CIRP Annals – Manufacturing Technology, Vol.52, pp. 85-88, 2003. C. Lartigue, C. Tournier, M. Ritou, and D. Dumur, “High-performance NC for HSM by means of polynomial trajectories,” CIRP Annals – Manufacturing Technology, Vol.53, pp. 317-320, 2004. K. Erkorkmaz, A. Alzaydi, A. Elfizy, and S. Engin, “Time-optimal trajectory generation for 5-axis on-the-fly laser drilling,” CIRP Annals – Manufacturing Technology, Vol.60, pp. 411-414, 2011. K. Erkorkmaz, A. Alzaydi, A. Elfizy, and S. Engin, “Time-optimized hole sequence planning for 5-axis on-the-fly laser drilling,” CIRP Annals – Manufacturing Technology, Vol.63, pp. 377-380, 2014. M. Mitsuishi, N. Sugita, K. Fujiwara, N. Abe, T. Ozaki, M. Suzuki, H. Moriya, T. Inoue, K. Kuramoto, Y. Nakashima, and K. Tanimoto, “Development of a medical CAD/CAM system for orthopedic surgery,” CIRP Annals – Manufacturing Technology, Vol.56, pp. 405-410, 2007. N. Sugita, T. Nakano, N. Abe, K. Fujiwara, T. Ozaki, M. Suzuki, and M. Mitsuishi, “Toolpath strategy based on geometric model for multi-axis medical machine tool,” CIRP Annals – Manufacturing Technology, Vol.60, pp. 419-424, 2011. F. Sellmann, T. Haas, H. Nguyen, S. Weikert, and K. Wegener, “Orientation smoothing for 5-axis machining using quasi-redundant degrees of freedom,” Int. J. of Automation Technology, Vol.10, No.2, pp. 262-271, 2016. F. Sellmann, T. Haas, H. Nguyen, S. Weikert, and K. Wegener, “Geometry optimisation for 2D cutting: A quadratic programming approach,” Int. J. of Automation Technology, Vol.10, No.2, pp. 272-281, 2016. B. Lauwers, and P.P. Lefebvre, “Five-axis rough milling strategies for complex shaped cavities based on morphing technology,” CIRP Annals – Manufacturing Technology, Vol.55, pp. 59-62, 2006. B. Lauwers, and D. Plakhotnik, “Five-axis milling tool path generation with dynamic step-over calculation based on integrated material removal simulation,” CIRP Annals – Manufacturing Technology, Vol.61, pp. 139-142, 2012. Y. Mizugaki, M. Hao, and K. Kikkawa, “Geometric generating mechanism of machined surface by ball-nosed end milling,” CIRP Annals – Manufacturing Technology, Vol.50, pp. 69-72, 2001. Y. Mizugaki, K. Kikkawa, H. Terai, and M. Hao, “Theoretical estimation of machined surface profile based on cutting edge movement and tool orientation in ball-nosed end milling,” CIRP Annals – Manufacturing Technology, Vol.52, pp. 49-52, 2003. M. Kanamaru, N. Sakai, A. Goto, and T. Hida, “Development of simulation technology for 5-axis machines – Verification of material removal model and collision avoidance –,” Int. J. of Automation Technology, Vol.1, No.2, pp. 141-146, 2007. Y. Takeuchi, and T. Watanabe, “Generation of 5-axis control collision-free tool path and postprocessing for NC data,” CIRP Annals – Manufacturing Technology, Vol.41, pp. 539-542, 1992. K. Morishige, Y. Takeuchi, and K. Kase, “Tool path generation using C-Space for 5-axis control machining,” Trans. of the ASME, J. of Manufacturing Science and Engineering, Vol.121, Issue 1, pp. 144-149, 1999. K. Morishige, and M. Kaneko, “Tool path generation for five-axis controlled machining with consideration of motion of two rotational axes,” Int. J. of Automation Technology, Vol.5, No.3, pp. 412-419, 2011. T. Kanda, and K. Morishige, “Tool path generation for five-axis controlled machining with consideration of structural interference,” Int. J. of Automation Technology, Vol.6, No.6, pp. 710-716, 2012. J. Kaneko, and K. Horio, “Tool posture planning method for continuous 5-axis control machining on machine tool coordinate system to optimize motion of translational axes,” Int. J. of Automation Technology, Vol.5, No.5, pp. 729-737, 2011. J. Kaneko, and K. Horio, “Tool posture planning method for continuous multi axis control machining with consideration of shortening shank length of end mill,” Int. J. of Automation Technology, Vol.6, No.5, pp. 648-653, 2012. X. Tian, H. Deng, M. Fujishima, and K. Yamazaki, “Quick 3D modeling of machining environment by means of on-machine stereo vision with digital decomposition,” CIRP Annals – Manufacturing Technology, Vol.56, pp. 411-414, 2007. Y. Altintas, and K. Erkorkmaz, “Feedrate optimization for spline interpolation in high speed machine tools,” CIRP Annals – Manufacturing Technology, Vol.52, pp. 297-302, 2003. A. Rangarajan, and D. Dornfeld, “Efficient tool paths and part orientation for face milling,” CIRP Annals – Manufacturing Technology, Vol.53, pp. 73-76, 2004. Y. Altintas, and S. Tulsyan, “Prediction of part machining cycle times via virtual CNC,” CIRP Annals – Manufacturing Technology, Vol.64, pp. 361-364, 2015. M. Dölen, B. Kaftanoglu, and R.D. Lorenz, “A cutting force estimator for CNC machining centers,” CIRP Annals – Manufacturing Technology, Vol.53, pp. 313-316, 2004. H. Narita, K. Shirase, E. Arai, and H. Fujimoto, “Trial surface-property prediction in end-mill operation,” Int. J. of Automation Technology, Vol.4, No.3, pp. 229-234, 2010. H. Narita, “A determination method of cutting coefficients in ball end milling forces model,” Int. J. of Automation Technology, Vol.7, No.1, pp. 39-44, 2013. J. Kaneko, and K. Horio, “Fast cutter workpiece engagement estimation method for prediction of instantaneous cutting force in continuous multi-axis controlled machining,” Int. J. of Automation Technology, Vol.7, No.4, pp. 391-400, 2013. T. Matsumura, M. Shimada, K. Teramoto, and E. Usui, “Predictive cutting force model and cutting force chart for milling with cutter axis inclination,” Int. J. of Automation Technology, Vol.7, No.1, pp. 30-38, 2013. T. Matsumura, and E. Usui, “Predictive cutting force model in complex-shaped end milling based on minimum cutting energy,” Int. J. of Machine Tools and Manufacture, Vol.50, pp. 458-466, 2010. I. Lazoglu, Y. Boz, and H. Erdim, “Five-axis milling mechanics for complex free form surfaces,” CIRP Annals – Manufacturing Technology, Vol.60, pp. 117-120, 2011. S.E. Layegh K., I.E. Yigit, and I. Lazoglu, “Analysis of tool orientation for 5-axis ball-end milling of flexible parts,” CIRP Annals – Manufacturing Technology, Vol.64, pp. 97-100, 2015. Y. Oda, M. Mori, K. Ogawa, S. Nishida, M. Fujishima, and T. Kawamura, “Study of optimal cutting condition for energy efficiency improvement in ball end milling with tool-workpiece inclination,” CIRP Annals – Manufacturing Technology, Vol.61, pp. 119-122, 2012. E. Budak, I. Lazoglu, and B.U. Guzel, “Improving cycle time in sculptured surface machining through force modeling,” CIRP Annals – Manufacturing Technology, Vol.53, pp. 103-106, 2004. E. Budak, E. Ozturk, and L.T. Tunc, “Modeling and simulation of 5-axis milling processes,” CIRP Annals – Manufacturing Technology, Vol.58, pp. 347-350, 2009. L.T. Tunc, E. Budak, S. Bilgen, and M. Zatarain, “Process simulation integrated tool axis selection for 5-axis tool path generation,” CIRP Annals – Manufacturing Technology, Vol.65, pp. 381-384, 2016. M.M. Isnaini and and K. Shirase, “Review of computer-aided process planning systems for machining operation – Future development of a computer-aided process planning system –,” Int. J. of Automation Technology, Vol.8, No.3, pp. 317-332, 2014. T. Mwinuka, S. Hinduja, and O.O. Owodunni, “Extendible operation sequencing for turn-milled components,” CIRP Annals – Manufacturing Technology, Vol.56, pp. 473-478, 2007. L. Wang, M. Holm, and G. Adamson,“Embedding a process plan in function blocks for adaptive machining,” CIRP Annals – Manufacturing Technology, Vol.59, pp. 433-436, 2010. Y. Nonaka, G. Erdös, T. Kis, A. Kovács, L. Monostori, T. Nakano, and J. Váncza, “Generating alternative process plans for complex parts,” CIRP Annals – Manufacturing Technology, Vol.62, pp. 453-458, 2013. Y. Woo, E. Wang, Y. S. Kim, and H.M. Rho, “A hybrid feature recognizer for machining process planning systems,” CIRP Annals – Manufacturing Technology, Vol.54, pp. 397-400, 2005. K. Shirase, and K. Nakamoto, “Simulation technologies for the development of an autonomous and intelligent machine tool,” Int. J. of Automation Technology, Vol.7, No.1, pp. 6-15, 2013. J. Zhu, M. Kato, T. Tanaka, H. Yoshioka, and Y. Sato, “Graph based automatic process planning system for multi-tasking machine,” J. of Advanced Mechanical Design, Systems, and Manufacturing, Vol.9, No.3, 15-00296, 2015. Y. Koike, A. Matsubara, and I. Yamaji, “Design method of material removal process for minimizing workpiece displacement at cutting point,” CIRP Annals – Manufacturing Technology, Vol.62, pp. 419-422, 2013. J. Kaneko, and K. Horio, “Workpiece fixture planning method for continuous multi-axis machining with consideration of motion on translational axis” Int. J. of Automation Technology, Vol.6, No.6, pp. 775-780, 2012. S. Baba, K. Nakamoto, and Y. Takeuchi, “Multi-axis control ultraprecision machining based on tool setting errors compensation” Int. J. of Automation Technology, Vol.10, No.1, pp. 114-120, 2016. T. Altan, B. Lilly, and Y.C. Yen, “Manufacturing of dies and molds,” CIRP Annals – Manufacturing Technology, Vol.50, pp. 405-423, 2001. M. Yamada, T. Kondo, F. Tanaka, and T. Kishinami, “Tilted tool axis machining on 5-axis machine tools” Int. J. of Automation Technology, Vol.7, No.1, pp. 120-127, 2007. J. Kaneko, Y. Yamauchi, and K. Horio, “Fast estimation method of machinable area of workpiece surface for 3+2-axis control machining using graphics device – Visualization algorithm of machinable area and minimum shank length with texture projection technique –” Int. J. of Automation Technology, Vol.8, No.3, pp. 420-427, 2014. H. Sasahara, A. Kato, H. Nakajimaa, H. Yamamoto, T. Muraki, and M. Tsutsumi, “High-speed rotary cutting of difficult-to-cut materials on multitasking lathe” Int. J. of Machine Tools and Manufacture, Vol.48, pp. 841-850, 2008. A. Hosokawa, T. Ueda, R. Onishi, R. Tanaka, and T. Furumoto, “Turning of difficult-to-machine materials with actively driven rotary tool,” CIRP Annals – Manufacturing Technology, Vol.59, pp. 89-92, 2010. E. Uhlmann, F. Kaulfersch, and M. Roeder, “Turning of high-performance materials with rotating indexable inserts,” Procedia CIRP, Vol.14, pp. 610-615, 2014. U. Karagüzel, E. Uysal, E. Budak, and M. Bakkal, “Analytical modeling of turn-milling process geometry, kinematics and mechanics” Int. J. of Machine Tools and Manufacture, Vol.91, pp. 24-33, 2015. U. Karagüzel, E. Uysal, E. Budak, and M. Bakkal, “Effects of tool axis offset in turn-milling process” J. of Materials Processing Technology, Vol.231, pp. 239-247, 2016. D. Spath, and A. Hühsam, “Skiving for high-performance machining of periodic structures,” CIRP Annals – Manufacturing Technology, Vol.51, pp. 91-94, 2002. Y. Kakinuma, S. Kidani, and T. Aoyama, “Ultra-precision cryogenic machining of viscoelastic polymers” CIRP Annals – Manufacturing Technology, Vol.61, pp. 79-82, 2012. K. Nakamoto, T. Iizuka, and Y. Takeuchi, “Dexterous machining of soft objects by means of flexible clamper” Int. J. of Automation Technology, Vol.9, No.1, pp. 83-88, 2015. K. Funatani, K. Nakamoto, A. Beaucamp, and Y. Takeuchi, “Dexterous creation of soccer-ball pattern by using urethane rubber” Int. J. of Automation Technology, Vol.10, No.2, pp. 239-243, 2016. M. Mori, M. Fujishima, and Y. Oda, “5 axis mill turn and hybrid machining for advanced application,” Procedia CIRP, Vol.1, pp. 22-27, 2012. T. Yamazaki, “Development of a hybrid multi-tasking machine tool: Integration of additive manufacturing technology with CNC machining,” Procedia CIRP, Vol.42, pp. 81-86, 2016.